Traffic disruptions throughout Jerusalem after stone throwing in Arab neighborhoods damaged 9 trains. 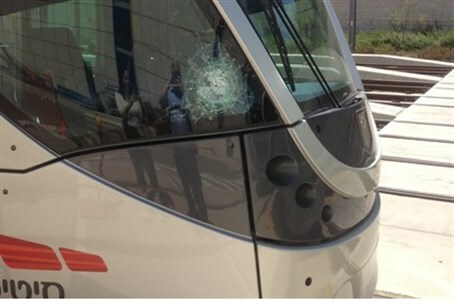 The management of the Jerusalem Light Rail has long been faced with the phenomenon of rock-throwing Arab youths in eastern Jerusalem. The damage caused to Light Rail trains in recent weeks has also caused significant traffic disruption in Israel's capital. Saturday night saw four separate incidents of rock throwing in Arab neighborhoods. No one was hurt, but the windows of the trains sustained damage. Light Rail management reported the cases last night of Arabs throwing stones and blocks at trains, stating that only 14 out of 23 trains are now in commission because of these and similar incidents. This means that 40% of trains traveling frequently through that line have been damaged. The combined physical and economic damage is also expected to create significant delays in arrival of trains to stations. In response to these and other such terror acts in Jerusalem, Mayor Nir Barkat has written to Prime Minister Binyamin Netanyahu demanding that this silent terror wave be forcibly ended. Train data shows that since the outbreak of violence in early July there have been about 100 such incidents, most of them occurring at night, sometimes at the rate of three incidents an hour. Cars have also been damaged by rocks or by partial (stolen) use. The financial damage of the last two months is estimated at half a million NIS (~$134,000).